Mazda is unveiling the all-new Mazda CX-5 compact crossover SUV at the 2011 Frankfurt Motor Show. The CX-5 is the first vehicle of a new Mazda generation that will adopt the full range of Mazda's breakthrough SKYACTIV TECHNOLOGY and new design theme, 'KODO - Soul of Motion', which was showcased by the Mazda SHINARI and Mazda MINAGI concept cars. The new Mazda CX-5 will be introduced progressively to global markets beginning early in 2012. Developed around SKYACTIV TECHNOLOGY - including all-new Mazda petrol and diesel engines, manual and automatic transmissions, body and chassis - the CX-5 delivers precise response and a high-quality, rewarding ride matched to outstanding environmental and safety performance. The CX-5 is the first of a new generation of Mazda vehicles that will evolve the company's hallmark fun-to-drive character by providing a new level of driving pleasure. CX-5 Programme Manager, Hideaki Tanaka, says: "We aimed to develop a vehicle with a long-term appeal that would delight owners and make them proud for years to come. I think that these were the most important values we had to embody in the CX-5. We wanted to deliver the best of all worlds in order to suit the various lifestyles and life stages of our customers, and satisfy their high expectations over the long term. Specifically, we focused on providing pleasure through the CX-5's appearance, ist precise handling, its insightful functionality, and its long-term appeal. By aiming to achieve the ideal in each area, we pursued the innovation of driving pleasure." The Mazda CX-5 development team focused on form, performance, function and texture, investigated all points of contact between the driver and the vehicle, and examined how to make them more pleasing. Then they prioritized ergonomic design and concentrated on the most essential elements in order to provide a "purer" sense of driving pleasure. Following the Mazda MINAGI concept car that was unveiled at the 2011 Geneva Motor Show, the CX-5 becomes the first production model to feature Mazda's new design theme, 'KODO - Soul of Motion'. Chief Designer, Masashi Nakayama says: "With the CX-5, our focus was on expressing a strong sense of vitality and agility. We looked at videos of cheetahs; their agile footwork and how they use their entire body as a spring to accelerate rapidly and change the direction instantly. They emanate great energy throughout their entire body. Inspired by their efficient yet beautiful movements, we aimed to push the SUV appearance to new levels with KODO design language." The exterior design features bold styling that simultaneously expresses SUV-like solidity and functionality with Mazda's characteristic sense of vitality and agility. Inside, Mazda created a driver-oriented cabin with solid styling that reflects the Mazda CX-5's strength and high rigidity. Over the years Mazda has often explored the idea of 'motion' to inspire its unique vehicle designs. The new generation of Mazda cars, beginning with the CX-5 compact crossover SUV, is influenced by nature's power and beauty. They have been evolved by taking the instantaneous movement of animals or humans as inspiration. This instantaneous movement is the ultimate form of motion, filled with vitality and emotion; it is the essence of Mazda's new design language 'KODO - Soul of Motion'. The new design language was first introduced in 2010 with the SHINARI concept, a 4-door sports coupe created by the design team led by Ikuo Maeda, General Manager Design Division of Mazda Corporation. The Shinari incorporates all design elements of the KODO theme and was followed by the MINAGI concept car, a compact crossover SUV that was the forerunner of today's Mazda CX-5, the first mass production vehicle that fully applies KODO design. Front view: a new Mazda family face centred on a new 'signature wing' expresses strength and depth. Rear view: The contrast of prominent rear fenders and taut rear end conveys toughness and grace that underline its athletic form. Side view: The prominent front fenders and sculptured body sides accentuate a sense of power which suggests powerful muscles. The exterior design contributes to excellent aerodynamics (Target Cd of 0.33) and a quite cabin. The driver's side, especially the meter hood, has a deep, longitudinally stretched design that resembles a cockpit and produces a sense of forward momentum. The detailed, high-quality meter design raises the driver's anticipation for the ride ahead. On the passenger side, the instrument panel looks ample and solid, with a horizontal design that generates a sense of security. New soft materials are adopted for the instrument panel and door trim that are most often seen and touched. Parts that are used most often, like the steering wheels spokes and inner door handles, have a satin chrome finish, which enhances the high-quality, genuine feel of the interior. The development team thoroughly researched what features are needed to deliver comfort and convenience, and focused on providing flexibility that drivers and passengers can enjoy with ease. The development team realized a comfortable and user-friendly interior with noticeably efficient use of space and intelligent functionality. Additionally, the human-machine interface (HMI) presents information in an intuitive and easy-to-understand way that can be read in an instant, in order to minimize the driver's eye movement and create a cockpit environment that aids driver concentration. The 2,700 mm wheelbase, one of the segment's longest, enabled streamlined styling and a comfortable cabin. Class-leading rear seat legroom of 997 mm. Spacious rear seats in which adult passengers can ride in comfort with ample knee space. 500 litres of useable luggage space (including a sub trunk) is maximized by removing protrusions and dead space. Smart, easy-to-use KARAKURI functionality. The world's first 40:20:40 split independent rear seats with a remote fold-down function. The rear centre seat creates a large flat luggage space when folded down. The tonneau cover automatically lifts up and down as the rear liftgate is opened and closed. As well as comfortably accommodating two adults, the 40:20:40 split rear seats enable long objects to be loaded by folding the centre seat down flat, even with two child seats installed on both sides. The rear seats can be folded down remotely by a simple flick of levers located at the back of the luggage area. Provides generous storage capacity demanded of an SUV, including a large open space in the centre console that can hold all sorts of items, and front and rear door pockets large enough to take a 1-litre bottle. A 5.8-inch colour touch screen monitor is positioned in the centre at the top of the dashboard, and shows data related to the infotainment system — including audio, phone connection — and contains the new navigation system. Mazda CX-5's new HMI system improves safety by minimizing the driver's eye movement away from the road. The menu controls for the steering-wheel-mounted switches are arranged according to function, a centre display touch screen, and a HMI commander are positioned on the centre console. With the vehicle stopped, the driver might operate it by touch screen. During driving, the driver can operate the menu more safely and easily with the HMI commander. This layout also enables some functions, especially navigation, to be operated intuitively from the passenger seat. Its new integrated navigation system is based on the latest TomTom® technology, one of Europe's most popular provider of navigation system. For an affordable price, customers can enjoy more accurate arrival-time estimates, which are calculated based on previously recorded data, and better suggestions for alternate routes to avoid traffic jams. By accessing the homepage through a personal computer at home, customers can also download new roads that are not listed on maps. For an extra fee, TomTom® Live Services are also available depending on country). These provides more accurate real-time traffic information, weather forecasts, fuel prices and other constantly updated information. For high connectivity, customers can connect their mobile MP3 players or mobile phones via USB or Bluetooth® connection to the HMI system. Searching for your favourite song is made easy as title, album and artist will be displayed on the touch screen. The best way to listen to your favourite music in the Mazda CX-5 is on a BOSE® surround-sound system - with a new-generation energy-efficient amplifier and subwoofer. First, the development team focused on creating a cockpit environment to communicate the driver's intention to the vehicle. To enable linear operation, they optimized every point of contact between car and driver including driving position, pedals, steering wheel, seat hold, and field-of-view. Next, they examined the quality of feedback coming from the car. The test drivers judged this quality by asking, "Did I control the car as I wanted?" and "Do I need to change the way the car responds?" In order to boost the quality of vehicle feedback, the team worked on making the feedback match the driver's expectations by making it highly predictable. Their objective here is to enable the driver to input his intention with a single action, removing the need for any corrective inputs and creating conditions where the driver and vehicle are perfectly synchronized. In addition to this, the team added an overall development target to create ideal conditions in which the driver's input and vehicle feedback were in complete harmony over the full range of motions from going, turning and stopping. The superb ride quality of the Mazda CX-5, and its precise response, can be felt the instant the steering wheel and pedals are operated, and this feeling intensifies the more one drives it. The Mazda CX-5 has newly-developed strut suspension in the front and a multi-link layout in the rear. The geometry of the suspension links and the bush characteristics are optimized to ensure light, linear steering response at mid-to-low speeds and excellent high-speed stability. The rear dampers also have a forward-tilting layout, increasing comfort even on rough road surfaces. A newly-developed electric power assist steering system offers highly precise control according to vehicle speed. At mid-to-low speeds, it provides natural feedback and linear feeling from small to large angle inputs. At high speeds, it gives firm, confidence-inspiring feedback. The brakes deliver easily-controllable, precise and assured braking performance from low to high speeds. The lightweight yet rigid SKYACTIV-BODY framework is optimized for handling stability, low NVH and excellent collision safety performance. It supports the Mazda CX-5's rewarding and high-quality, responsive ride. Care was taken with NVH to ensure the driver hears necessary audio feedback while actively eliminating intrusive noises. Noises were initially separated into road noise and engine noise. For each, the unpleasant low-frequency, mid-frequency and high-frequency noises were individually identified and efficiently eradicated, resulting in a quiet cabin environment. To achieve smooth airflow under the vehicle and suppress eddies forming behind it, the air is directed upwards using a new underfloor design. The development team effectively reduced underfloor air resistance and optimized the aerodynamic shape of the upper body argeting an outstanding Cd of 0.33. A High Power version developing maximum torque of 420 Nm at 2,000 rpm and maximum power of 129 kW / 175 PS at 4,500 rpm. A Standard Power version produces maximum torque of 380 Nm at 1,800-2,600 rpm and maximum power of 110 kW / 150 PS at 4,500 rpm. The six-speed SKYACTIV-DRIVE automatic transmission provides linear acceleration and a direct shift feel similar to a dual clutch transmission. The six-speed SKYACTIV-MT manual transmission, with ist compact architecture and enhanced gear structure, delivers the light and crisp shift feel known from the MX-5. Both support fuel efficiency and the high-quality ride feel of the CX-5. The Mazda CX-5 uses the full array of SKYACTIV Technologies to achieve outstanding fuel economy and emissions performance without sacrificing its fun-to-drive character. In terms of safety, Mazda's fundamental approach is to "inspire peace-of-mind and confidence in order to enhance driving pleasure." Based on this approach, Mazda engineers worked to advance the vehicle's core performance attributes of "driving, turning and stopping" as well as visibility and operability. Thanks to the lightweight and highly-rigid SKYACTIV-BODY, the CX-5 provides excellent collision performance that will attain top ratings in crash tests around the world. The SKYACTIV-G 2.0 petrol engine with FWD, 6-speed manual transmission and i-stop system targets a mere 6.0 litres of fuel per 100 km (combined) with CO2 emission of 139 g/km. The SKYACTIV-D 2.2 diesel engine with FWD, 6-speed manual transmission and i-stop system targets just 4.5 litres per 100 km (combined) with CO2 emission of just 119 g/km. The SKYACTIV-D engine meets Euro Stage 6 emission standards without adopting an expensive NOx after-treatment system. The SKYACTIV-DRIVE automatic transmission with its new lock-up clutch, achieves lock-up in almost all driving conditions. This reduces transmission slip significantly and contributes to fuel efficiency. It is available for both petrol and diesel engines. Mazda's idling-stop system, i-stop, is available for the CX-5 with both SKYACTIV-G and -D. It has previously been used only with petrol engine models. With a newly-developed, more advanced control system, the new i-stop shuts off the engine more frequently, helping to further improve real-world fuel economy. Single-nanotechnology in the catalyst improves exhaust gas after-treatment performance and reduces the amount of precious metals required. 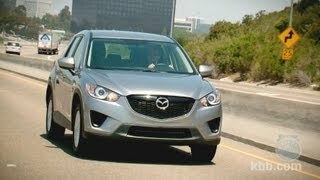 The Mazda CX-5 is one of the lightest and most aerodynamic vehicle in its class, which contributes to its outstanding fuel economy and low CO2 emissions. The base of the A-pillars has been optimized to ensure excellent forward visibility on winding roads and at junctions. The side mirrors are mounted on the doors themselves to create a gap between the mirrors and A-pillars through which drivers can check their surroundings. Smart City Brake Support (SCBS) is standard for mid and high grade (first in the compact SUV segment) and uses a new radar sensor system to help prevent or reduce impact of front crash accidents at low speed (up to 30 km/h) by automatically braking the vehicle. Upgraded Rear Vehicle Monitoring System (RVM) that detects cars approaching from behind or driving in the blind spot and warns the driver (now from 30 km/h onwards instead of 60 km/h to support city driving safety). Lane Departure Warning minimizes the risk of leaving the driving lane unintentionally by employing a camera to detect and judge the position of white lines to then warn the driver of a possible lane departure. High-Beam Control (HBC) automatically changes between low and high beam during night driving in order to avoid blinding upcoming vehicles. The lightweight, highly-rigid SKYACTIV-BODY provides excellent collision performance and is conceived to attain top ratings in crash tests around the world. A multi-load path structure and a front end with a cross-shaped cross-section increases crash energy absorption, further improving safety performance in frontal, side and rear-end collisions. HIROSHIMA, Japan (April 18, 2011) – Mazda Motor Corporation today announced that its new compact crossover SUV will be called the Mazda CX-5. It is the production model derived from the Mazda MINAGI Concept, which debuted at the Geneva Motor Show (81e Salon International de l'Auto de Genève) in March of this year and will be shown at the New York International Auto Show that opens to the public on April 22, 2011. The CX-5 will be the first production vehicle to incorporate Mazda’s new design theme, ‘KODO – Soul of Motion’ as debuted on the Mazda SHINARI concept car, as well as the full range of breakthrough SKYACTIV technologies, including engines, transmissions, body and chassis. The CX-5 will join Mazda’s global line-up in 2012. The Mazda CX-5 will make its international debut at the 64th IAA (Internationale Automobil-Ausstellung) Motor Show to be held in Frankfurt, Germany in September 2011. Mazda North American Operations is headquartered in Irvine, Calif. and oversees the sales, marketing, parts and customer service support of Mazda vehicles in the United States, Canada and Mexico through nearly 900 dealers. Operations in Canada are managed by Mazda Canada, Inc., located in Ontario; and in Mexico by Mazda Motor de Mexico in Mexico City.